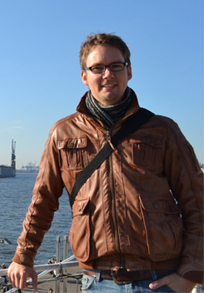 I'm a researcher at Siemens in Munich (Germany) and currently responsible for the technical and scientific coordination of the EU H2020 project BIG IoT. Previously, I worked at the Environmental Systems Research Institute, the 52°North initiative, and the Institute for Geoinformatics at the University of Münster. I received my PhD at the ITC Faculty of the University of Twente (Netherlands). My research interests lay in the broader field of distributed systems, the internet of things, semantic web technologies, the sensor web, participatory sensing, as well as mobile and location based services. My research has contributed to over 70 publications, multiple patent filings, various research and innovation projects, and laid the foundation for a startup based on the SenseBox design. I am involved in standards development at the W3C Web of Things group. Previously, I worked on standards at OGC's Sensor Web Enablement (SWE) initiative: as the chair of the Sensor Observation Service (SOS) working group, I edited the SOS 2.0 standard, and contributed to the PUCK protocol standard, as well as the SWE Service Model standard. I'm continuously looking for excellent students to work with me in areas related to my topics of interest. This work can start as an internship, or if the student has demonstrated scientific capability, he/she can directly start with a thesis project. See my Google Scholar profile to get an overview of my academic work and where it is cited. Seeger, J., R.A. Deshmukh, V. Sarafov & Bröring, A. (2019, in press): Dynamic IoT Choreographies - Managing Discovery, Distribution, Failure and Reconfiguration. IEEE Pervasive Computing. Jirka, S., A. Bröring & C. Stasch (2009): Discovery Mechanisms for the Sensor Web. Sensors, 9(4), pp. 2661-2681. Senaratne, H., A. Bröring, T. Schreck & D. Lehle (2014): Moving on Twitter: Using Episodic Hotspot and Drift Analysis to Detect and Characterise Spatial Trajectories. (Best Student Paper) 7th ACM SIGSPATIAL International Workshop on Location-Based Social Networks (LBSN 2014). 4. November 2014. Dallas, TX, USA. Toma, D.M., J. del Rio, A. Manuel, M. Moreno, A. Bröring, J. Pearlman & E. Delory (2013): Interoperability developments for next generation multifunctional ocean sensor systems in NeXOS. 5th Internatioanl Workshop on Marine Technology, MARTECH-2013, 10.-11. October 2013. Girona, Spain. Jirka, S., A. Remke & A. Bröring (2013): enviroCar – Crowd Sourced Traffic and Environment Data for Sustainable Mobility. Environmental Information Systems and Services - Infrastructures and Platforms 2013 - with Citizens Observatories, Linked Open Data and SEIS/SDI Best Practices (ENVIP 2013) co-located with the International Symposium on Environmental Software Systems 2013 (ISESS 2013). 9. October 2013. Neusiedl am See, Austria. CEUR Workshop Proceedings. Jirka, S., J. Brauner, A. Bröring, S. Kunz, I. Simonis & K. Watson (2012): Application of Sensor Web Technology for Analysing Correlations between Health and Environmental Data. In: H.-K. Arndt, G. Knetsch & W. Pillmann (Eds.). 26th EnviroInfo Conference - Man*Environment*Bauhaus - Light up the Ideas of Environmental Informatics. 29.-31.August 2012. Dessau, Germany. Shaker, pp. 103–110. Malewski, C., I. Simonis, A. Terhorst & A. Bröring (2011): StarFL - A new Metadata Language for Sensor Descriptions - Or: Why do we need yet another metadata language for sensor descriptions?. Workshop on Sensor Web Enablement 2011 (SWE 2011) as part of Cybera Summit 2011. 6.-7. October 2011. Banff, Canada. Foerster, T., A. Bröring, S. Jirka & J. Mueller (2009): Sensor Web and Geoprocessing Services for Pervasive Advertising. Proceedings of: Informatik 2009 - 2nd Workshop on Pervasive Advertising. September 28. - October 2. 2009. Luebeck, Germany. GI Lecture Notes in Informatics (LNI), GI - Gesellschaft fuer Informatik. Jirka, S., A. Bröring & C. Stasch (2009): Applying OGC Sensor Web Enablement to risk monitoring and disaster management. Workshop on "Sensorweb Enablement: Strengthening the SDI" at the GSDI 11 World Conference. June 15.-19. 2009. Rotterdam, Netherlands. Jirka, S., A. Remke, A. Bröring & M. Rieke (2013): enviroCar - Crowdsourcing automobiler Sensordaten für den nachhaltigen Strassenverkehr. In: Geoinformatik 2014 - Geoinformationen oeffnen das tor zur Welt. Hamburg, Germmany. 26.-28. March 2014. Jirka, S., A. Remke, A. Bröring & M. Rieke (2013): Erfuellung von INSPIRE-Verpflichtungen zu Anhang II und III-Themen mit Hilfe von Sensor Web-Technologie. In: Geoinformatik 2014 - Geoinformationen oeffnen das tor zur Welt. Hamburg, Germmany. 26.-28. March 2014. Jirka, S. & A. Bröring (2012): Practical Experiences with Sensor Web Technology. In: A. Ligtenberg & L. Kooistra (Eds.) Workshop Sensing a Changing World. 9.-11. May 2012. Wageningen, The Netherlands. Foerster, T., L. Diaz & A. Bröring (2011): Integrating Volunteered Human Sensor Data into Crowd-sourced Platforms: A Use Case on Noise Pollution Monitoring and OpenStreetMap. In: W. Pillmann, S. Schade, & P. Smits (Eds. ), Innovations in Sharing Environmental Observation and Information. 25th EnviroInfo Conference. 5.-7. October 2011. Ispra, Italy. Shaker, pp. 505-510. Lasnia, D., T. Foerster & A. Bröring (2011): Towards Linking the Digital and Real World with OpenThingMap. In: A. Schwering, E. Pebesma & K. Behncke (Eds. ), Geoinformatik 2011 - Geochange. 15.-17. June 2011. Münster. AKA, ifgiPrints, Volume 41, pp 205-211. Jürrens, E.H., A. Bröring & S. Jirka (2009): A Human Sensor Web for Water Availability Monitoring. Proceedings of: OneSpace 2009 - 2nd International Workshop on Blending Physical and Digital Spaces on the Internet. September 1. 2009. Berlin, Germany. Bröring, A., E.H. Juerrens, S. Jirka & C. Stasch (2009): Development of Sensor Web Applications with Open Source Software. (Best Paper Award). Proceedings of: First OSGIS UK Conference. June 22. 2009. Nottingham, UK. Bröring, A., S. Jirka, S. Benmoh & E.H. Jürrens (2009): UWeather - A Web Portal for your Weather Data. GISRUK 2009. April 1.-3. 2009. Durham, UK. Bröring, A. & O. Meyer (2008): Bereitstellung und Visualisierung hydrologischer Zeitreihen mit Hilfe standardisierter Webdienste. Angewandte Geoinformatik 2008. Beitraege zum 20. AGIT Symposium Salzburg. July 2.-4. 2008. Salzburg, Austria. Wichmann. Foerster, T., A. Bröring, B. Baranski, B. Pross, C. Stasch, T. Everding, & S. Maes (Eds.) (2011). Integrating Sensor Web and Web-based Geoprocessing. CEUR Workshop proceedings (Vol. 712). Utrecht, Netherlands: CEUR. Ferrera, E. et al. (2018)	IoT European Security and Privacy Projects: Integration, Architectures and Interoperability In: Vermesan, O. & J. Bacquet, Next Generation Internet of Things Distributed Intelligence at the Edge and Human Machine-to-Machine Cooperation. Chapter 7, pp. 207-292. River Publishers, ISBN: 9788770220071. Vermesan, O., A. Bröring, E. Tragos, M. Serrano, D. Bacciu, S. Chessa, C. Gallicchio, A. Micheli, M. Dragone, A. Saffiotti, P.r Simoens, F. Cavallo & R. Bahr (2017): Internet of Robotic Things - Converging Sensing/Actuating, Hyperconnectivity, Artificial Intelligence and IoT Platforms. In: Vermesan, O. & J. Bacquet, Cognitive Hyperconnected Digital Transformation - Internet of Things Intelligence Evolution. Chapter 4, pp. 97-155. River Publishers, ISBN: 9788793609105. Kubler, S., K. Främling, A. Zaslavsky, C. Doukas, E. Olivares, G. Fortino, C. E. Palau, S. Soursos, I. Podnar Zarko, Y. Fang, S. Krco, C. Heinz, C. Grimm, A. Bröring, J. Mitic, K. Olstedt & O. Vermesan (2016): IoT Platforms Initiative. In: Vermesan, O. & P. Friess, Digitising the Industry - Internet of Things Connecting the Physical, Digital and Virtual World. Chapter 9, pp. 265-292. River Publishers, ISBN: 978-87-93379-82-4. Bröring, A., J. Mitic & A. Ziller (2016): Smart-Traffic-Plattform – Basis intelligenter Verkehrsanwendungen. In: Renner, T. & M. von Tippelskirch, SHARED E-FLEET – Fahrzeugflotten wirtschaftlich betreiben und gemeinsam nutzen. Praxisleitfaden IT-Systeme und Betreibermodelle für das intelligente Management von (Elektro-) Fahrzeugflotten.. Chapter 7.1, pp. 139-143. Fraunhofer Verlag, ISBN: 978-3-8396-0976-7. Guillemin, P., F. Berens, M. Carugi, M. Arndt, L. Ladid, G. Percivall, B. D. Lathouwer, S.H.L. Liang, A. Bröring & P. Thubert (2013): Internet of Things Standardisation - Status, Requirements, Initiatives and Organisations. In: Vermesan, O. & P. Friess, Internet of Things - Converging Technologies for Smart Environments and Integrated Ecosystems. Chapter 7, pp. 259-276. IERC Cluster Book 2013, River Publishers, ISBN: 978-87-92982-73-5. Bröring, A., P. Beltrami, R. Lemmens & S. Jirka (2011): Automated Integration of Geosensors with the Sensor Web to Facilitate Flood Management. In: Tiefenbacher, J. P., Approaches to Managing Disaster - Assessing Hazards, Emergencies and Disaster Impacts. Chapter 4, pp. 65-80. Intech, ISBN 978-953-51-0294-6. Ziller, A. & A. Bröring (2015): Standards-based Smart Traffic solution from Shared-E-Fleet. In: International Transportation. Special issue on Urban Transport. May 2015. Volume 67. pp. 37-39. Kjeld, P., S. Jirka & A. Bröring (2012): A Sensor Web for Europe. GEO:connexion International Magazine. April 2012. Huntingdon, UK. pp. 36-37. Jirka, S. & A. Bröring (2011): Sensor Web - Praktische Anwendungsbeispiele. In: B. Harzer & B. Krebs (Eds. ), GIS-Report - Software, Daten, Firmen. 2011(12). Bernhard Harzer Verlag. pp. 15-22. Jirka, S., A. Bröring & A.C. Walkowski (2010): Sensor Web in Practice - Building Productive Systems. In: GEOInformatics - Magazine for Surveying, Mapping & GIS Professionals. 13(6). pp. 42-45. OGC SWE Implementation Maturity. OGC 13-032. (2013). Authors: Hobona, G., R. Griffith, M. Botts, A. Bröring, S. Liang, C. Gates, D. Mandl, E. Howlett, C. Reed, D. McKenzie, & G. Percivall. Open Geospatial Consortium. Approved Implementation Standard. Sensor Observation Service Interface Standard, Version 2.0. OGC 12-006. (2012). Editors: Bröring, A., C. Stasch & J. Echterhoff. Authors: Bröring, A., C. Stasch, J. Echterhoff, P. Taylor, L. Bermudez, A. Robin, J. de La Beaujardiere, T. Ingold, C. Hollmann & S. Cox. Open Geospatial Consortium. Approved Encoding Standard. PUCK Protocol Standard, Version 1.4. OGC 09-127r2. (2012). Authors: O'Reilly, T., K. Headley, D.R. Edgington, A. Manuel, J. del Rio, D.M. Toma, A. Bröring, L. Bermudez, R. Thomas, S. Fairgrieve, R. Gillespie, C. Waldmann & J. Graybeal. Open Geospatial Consortium. Discussion Paper. Lightweight SOS Profile for Stationary In-Situ Sensors. OGC 11-169. (2011). Editors: Jirka, S., C. Stasch & A. Bröring. Sensor Interface Descriptors. OGC 10-134. (2010). Editors: Bröring, A. & S. Below. OGC Catalogue Services Specification 2.0 - Extension Package for ebRIM Application Profile: SensorML. OGC 09-163. (2010). Editors: Houbie, F., F. Skiveé, S. Jirka. Authors: Houbie, F., F. Skiveé, A. Robin, S. Jirka, A. Bröring & D. Nüst. Sensor Observable Registry. OGC 09-112. (2009). Editors: Jirka, S. & A. Bröring. SensorML Profile for Discovery. OGC 09-033. (2009). Jirka, S., A. Bröring, A. Remke, M. Rieke (2014): enviroCar - Crowdsourcing zur Erhebung von Verkehrsdaten. Berlin, Germany. 19. - 21. March 2014. Bröring, A. (2013): enviroCar and Linked Data. Esri Europe, Middle East, and Africa User Conference (EMEA UC). Munich, Germany. 22. October 2013. Bröring, A. (2013): INSPIRE Compliant Provisioning of Environmental Data. INTERGEO. Essen, Germany. 8. October 2013. Bröring, A. (2013): enviroCar - Crowdsourcing von automobilen Sensordaten fuer Smart Cities. INTERGEO. Essen, Germany. 8. October 2013. 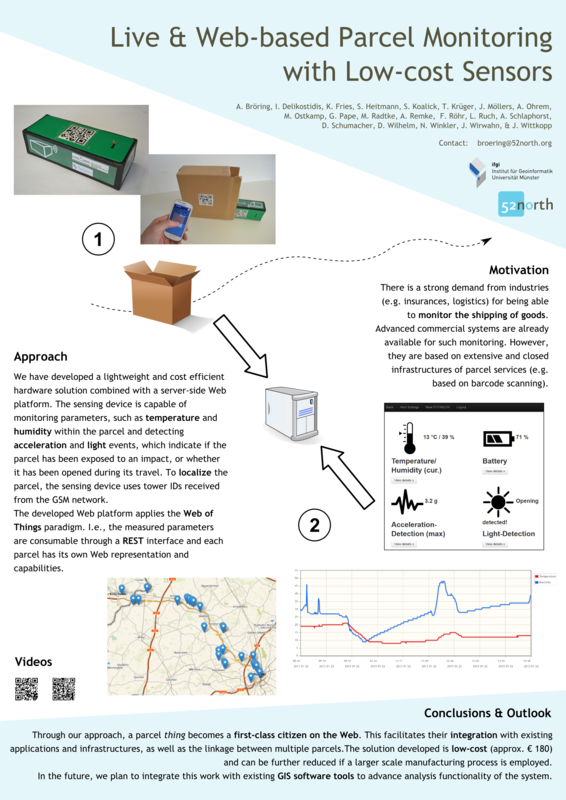 Bröring, A., S. Jirka, A. Kotsev, L. Spinsanti (2013): Making the Sensor Observation Service INSPIRE Compliant. INSPIRE Conference. Florence, Italy. 27. June 2013. Demuth, D., D. Nuest, A. Bröring, E. Pebesma (2013): The AirQuality SenseBox. Geophysical Research Abstracts Vol. 15, EGU2013-5146, 2013 EGU General Assembly 2013. Vienna, Austria. 7.-12. April 2013. Bröring, A. (2012): Realizing the EU Directive on e-Reporting of Ambient Air Quality with ArcGIS Server and OGC SOS. Presented at: INTERGEO. Hanover, Germany. October 10th 2012. Bröring, A. (2012): Using the Sensor Observation Service and Web Feature Service for Air Quality e-Reporting. Presented at: European Environment Agency (EEA), Copenhagen, Denmark. October 8th 2012. Bröring, A. (2012): The SenseBox. Presented at: GISTalk 2012. Munich, Germany. 22.-24. May 2012. Bröring, A. & S. Jirka (2011): Sensor Web in Practise. Presented at: Workshop on GI Research and instruction mixing commercial and Open Source Tools. In conjunction with 14th AGILE International Conference on Geographic Information Science. Utrecht, Netherlands. 18th April 2011. Bröring, A. (2010): Sensor Plug & Play with OGC standards. Presented at: ESONET Workshop. 13th December 2010. Marseille, France. Bröring, A. (2010): Sensor Interface Descriptors - Describing Instrument Protocols in a Standard Way With SensorML. Presented at: 2nd PESOS Workshop. 29th November 2010. Hamburg, Germany. Bröring, A. & S. Jirka (2010): Verwebung von Sozialen Netzwerken und dem Sensor Web. Presented at: FOSSGIS 2010. March 2.-5. 2010. Osnabrueck, Germany. Stasch, C. & A. Bröring (2009): Building a Web of Sensors - Introducing the OGC Sensor Web Enablement Initiative. Presented at: Third International Conference on GeoSpatial Semantics (GEOS 2009). 3.-4. December 2009. Mexico City, Mexico. Bröring, A., S. Jirka, C. Stasch & T. Everding (2009): Workshop: Sensor Web Enablement - Bringing Sensors into SDIs. FOSS4G 2009. October 20.-23. 2009. Sydney, Australia. Juerrens, E.H., A. Bröring, T. Everding, S. Jirka, & C. Stasch (2009): Building Human Sensor Webs with 52°North SWE Implementations. FOSS4G 2009. October 20.-23. 2009. Sydney, Australia. Jirka, S., A. Bröring & C. Stasch (2009): Workshop: Sensor Web Enablement - Strengthening the SDI. GSDI 11 World Conference. June 15.-19. 2009. Rotterdam, Netherlands. Bröring, A. (2009): Closing the Gap between Sensor Networks and the Sensor Web. GIScience for Dynamic Environmental Sensors Workshop. March 12. 2009. INPE, Brazil. Meyer, O. & A. Bröring (2008): Open Source Sensor Web Technologien für die Wasserwirtschaft. FOSSGIS 2008. April 1.-3. 2008. Freiburg. Germany. Bröring, A. (2007): How to encode sensor data? - Observations & Measurements. Sensor Web Enablement Workshop. German Aerospace Center (DLR). July 5.-6. 2007. Munich, Germany. Bröring, A. (2007): Sensor Observation Service - a pull-based access to observations and sensor descriptions. Sensor Web Enablement Workshop. German Aerospace Center (DLR). July 5.-6. 2007. Munich, Germany. Bröring, A. (2006): 52°North OX-Framework. INTERGEO 2006. October 10.-12. 2006. Munich, Germany. Bröring, A. (2012): Automated On-the-fly Integration of Geosensors with the Sensor Web. PhD Thesis. ITC Faculty, University of Twente. Dissertation 211. ISBN: 978-90-6164-334-0. July 2012. Enschede, The Netherlands. Bröring, A. (2007): Entwicklung eines Frameworks zur Visualisierung standardisierter Geodaten im Rahmen der SWE-Initiative. Diplomarbeit (equivalent to Master Thesis). Institute for Geoinformatics, University of Münster. March 2007. Münster, Germany.